Christmas is a celebration that seems to be centred around food and drink. So when you first go vegan it’s easy to imagine that all the pleasures of the season that you used to enjoy so much would no longer be on the menu. However, if you ask me, meat-eaters actually get the short end of the stick on Christmas Day. Yeara fter year, a dry, unappetising turkey takes centre stage amongst an array of tired old vegetable sides that get trotted out with every roast dinner. And for dessert, a slice of yule log or Christmas cake/ pudding is about as exciting as it gets! 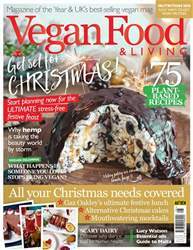 But when it comes to vegan options, we are so spoilt for choice these days that we have decided to split ourC hristmas issues over two months to showcase some of the very best sweet and savoury recipes on off er. Mince pie anyone? Start the celebrations right now from page 12.